A recent Stanford University study indicates that crackdowns on unauthorized immigration may interfere with the development of unborn children. 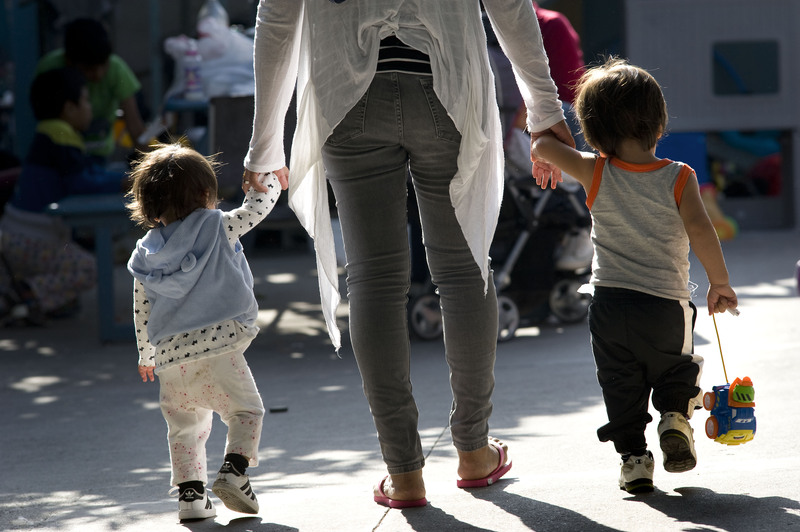 The study, conducted by the sociologists Florencia Torche and Catherine Sirois, analyzed fertility data from years before and after the April 2010 signing of S.B. 1070, a controversial Arizona law that originally mandated that law enforcement officers verify the immigration status of anyone they stopped. The bill, which was largely blocked by a court decision, would have also required noncitizens to carry proof of immigration status and made it a crime to hire anyone without a work permit. While the court blocked most of the law’s provisions, officers can still ask about legal status at their own discretion. The study found Latina immigrant women in Arizona who were pregnant during the contentious debate over S.B. 1070 and gave birth in the six-month period between July and December 2010 had babies with lower birthweight compared with those in prior years. Average birth weights did not decrease among U.S.-born white, black or Latina women during the same time. “It is the fear itself that can have a negative effect on women,” Dr. Torche said in an interview with America. She said the impact on birthweight began before the partial implementation of the law. Prior research has found that birthweight is an indicator of health, including morbidity, cognitive development and behavioral function, Dr. Torche said. Environmental stressors, from natural disasters to wars, have a negative impact on pregnant mothers, she said. The number of births among Latina immigrants in Arizona during the second half of 2010 also decreased. While the data does not specify the reason, the decrease in births could be explained by a number of factors, including intentional delay of pregnancy, miscarriage or abortion. Children would call their homes after school to see if it was “safe,” he said, explaining it was considered dangerous if police officers were in the neighborhood. Donald Kerwin, the executive director of the Center for Migration Studies, said that the debate around S.B. 1070 “was the most heated... of any bill at the state level.” The law served as a model for a number of other states that wanted to implement immigration enforcement reforms, he said. On a national level, Mr. Kerwin noted that recent immigration enforcement measures have had a negative impact on children of all ages. Older children feel the burden of assuming an adult role in the household, Mr. Kerwin said. The older siblings will serve a parental role and, in many ways, lose their childhood. Those born in the United States are citizens, including the majority of those children whose parents are deported, Mr. Kerwin noted. Dr. Torche also emphasized that Trump administration policies on immigration could be harmful to children and pregnant mothers. But she also said a nurturing community can help restore balance. Material from Catholic News Service was used in this report. This article was updated since initial publication to give more precise details of the Stanford University study. Implications- First, families or pregnant woman shouldn't come. Second, the study seems to suggest that those who encourage people to come illegally bear responsibility for the problems with the unborn children. I wonder if this will change the attitudes of the authors here at America, the magazine. You either are pro-life & "all-in" or you are not. The callousness of your reply suggests you are not. The fact that these policies harm children has been known by many for a very long time. It's just that it's been more convenient to ignore that harm and continue with the demonizatin of immigrants. Are you talking about Obama, Bill and Hillary Clinton, Joe Biden, John Kerry, Harry Reid? Republicans are for an intelligent legal immigrant system. Whereby someone doesn’t have wait years and spend 10’s of thousands of dollars and then watch someone just walk in. you can't have it both ways--immigrants coming from Catholic countries south of the border where the Church bears responsibility for preaching a message of high fertility + high birthrate-- and this to a population that is predominantly high poverty and low education. The fact that they arrive legally or illegally already pregnant is nobody's responsibility but the mother's and father's--and the Church's! --articles like this, reporting biased research, are really what makes people talk about fake news. The headline alone is shockingly irresponsible and would be more appropriate for the National Inquirer. America really needs to stop peddling this nonsense that "all migrants good/all opponents bad"....please treat us like adults! The Wall is a stupid idea. Not to mention that it would be a monument to racism. It would accomplish exactly nothing as people will find ways around it, beneath it, above it, etc. One wonders if conservatives ever bother to think beyond the knee-jerk. Is the huge wall around the Vatican, "a monument to racism"? "One wonders if" liberal Democrats and never-Trumpers "ever bother to think beyond the knee-jerk." Obama, Clinton, Soros et al have walls around their homes. Would you rather have someone knock on your door or crawl through your window? Israel has a wall, the Vatican has a wall, and what part of illegal don't you understand? We have laws for a reason, illegal immigration is costing the American taxpayer in many ways. Look beyond your fake news. This leaves sorrow and grief on our faces whenever any crisis affects young children. The ones who are not even born and they face issues after their birth is indeed very disturbing. I will surely write an article related to this informative post to my professor so that he can publish in our university. Thanks for sharing! With 'policy' based on lies, slander, and human indecency, this is a surprise? The first sentence contains the first hint that this whole article is tainted. It mentions, "unauthorized immigration;" there is a legal term which describes this situation perfectly clearly - illegal immigration. The next-to-last paragraph seems to contradict the rest of the article (and itself, as well): "Dr. Torche also emphasized that Trump administration policies on immigration could be harmful to children and pregnant mothers. But she also said a nurturing community can help restore balance." According to this information, Trump caused the unborn babies to be born underweight, but nurturing communities can cure the problem. Does that make sense? How can nurturing communities make the unborn heavier; how can they make it less stressful for children who have to call home to be sure no police are in the neighborhood? How is it that there is never anyone in favor of restricted immigration interviewed by the authors of these pro-illegal immigration articles? Does America mag. think there is only one side to this story? Years ago, I worked in a group home with disabled men. Several of my co-workers were immigrants from Liberia who had fled from a brutal civil war. They were good people who provided excellent care for the disabled men, and understandably wanted a better life for themselves and for their families. I'm a former Democrat of more than 25 years (I'm now 56). I've been a Republican for about 6 years. However, I still frequently agree with typical policies and proposed laws espoused by Democrats. However, although I favor increased border security, I disagree with President Trump's goal if building a wall along our border with Mexico. Further, although in my view we can't accept unlimited numbers of immigrants, I largely disagree with policies intended to penalize immigrants, whether legal or illegal. I know that it's unpopular to favor rights for illegal immigrants, but I believe that many are fleeing from violence and extreme poverty in their home countries. Our government in my opinion would do well to assist the impoverished nations of Latin America to develop tyeir economies to improve the lives of the people. As a pro-life moderate Republican, I'm certainly opposed to state laws that harm unborn human beings.